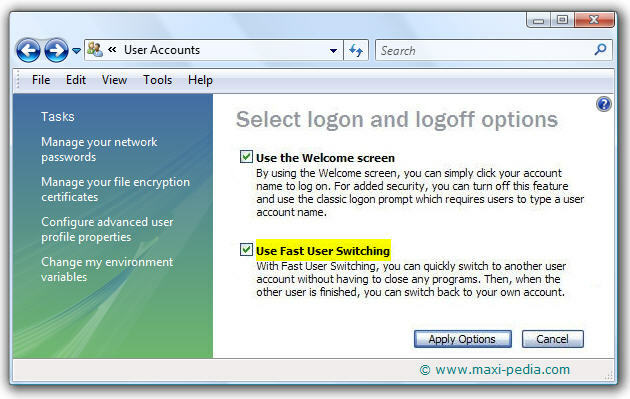 Fast user switching is a functionality on modern multi-user operating systems which allows multiple user accounts to log on to a computer simultaneously and then quickly switch between them without quitting applications and logging out. Fast user switching is available on Windows XP, Windows Vista, and Windows 7 as well. This guide explains how to disable fast user switching in Windows 7. Why would I want to disable fast user switching? First, this could be a security policy requirement. A security requirement might be that a user should completely quit all applications and log off from the computer after finishing his or her work on the computer. By disabling the fast user switching feature, you hide the Switch user button in the Logon user interface, in the Start menu, and in the Task Manager. Another reason could be performance issues. The fast user switching feature uses some system resources which can be freed in case the fast user switching functionality is not needed. How do I disable fast user switching in Windows 7? Click to uncheck the Use Fast User Switching check box, and then click Apply Options. Note: The Use Fast User Switching check box is unavailable if the Use the Welcome screen check box is not selected. Note: You need to be logged into the computer using the default local Administrator account. In case you do not have access to the Use Fast User Switching check box in the User Accounts administration utility, you can try the following method using the group policy editor. Enable the Hide entry points for Fast User Switching policy. Note: The Group Policy Editor is not included in certain editions of Windows. Another option is to edit registry keys using the registry editor. Create a DWORD (32-bit) Value named HideFastUserSwitching in the right pane and set the Value data for HideFastUserSwitching to 1. The print screen provided above shows how to disable fast user switching in Windows 7 using registry editor. Fast user switching is unavailable on computers running Windows XP when the computer is on a domain network. However, it is available for domain computers starting with Windows Vista.